GSP Ltd was founded in 2007. 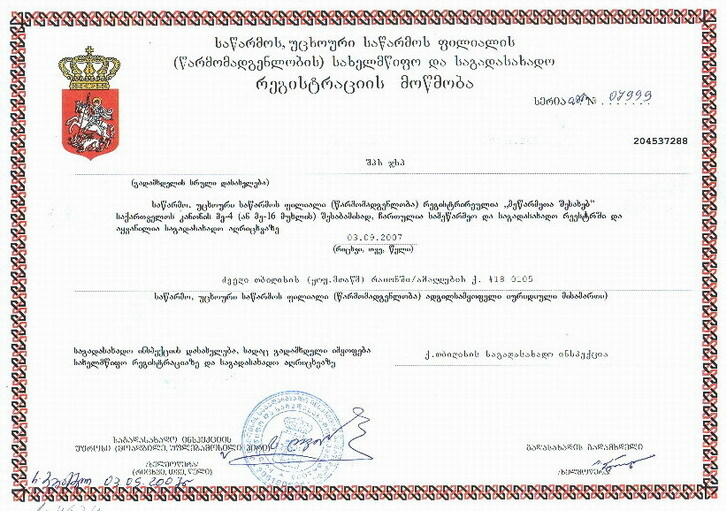 All registration documentation is in Georgian. Founders of the Company are highly skilled geologists, having extensive knowledge and practical experience in the scientific and administrative work in different fields of geology. Doctors of geology and mineralogy sciences David Kuparadze and Dimitri Pataridze over a number of years were cooperate in the several projects of different geological agencies and expeditions on the deposits in Georgia, North Caucasus (Russian Federation) and Ukraine. They took part in the international projects in the scope of the program for US Civil Research and Development Foundation- Science and Technology Entrepreneurship Program, other international projects, providing consulting services to Georgian and International Companies on exploration and preparation on licensing of the different mineral deposits. Director and co-founder of the GSP Ltd is a geologist with great experience. Mr. Irakli Kalandarishvili, over a number of years was a chief of the geological party of Geological Survey of Georgia, executive director of the Union "Resources of Georgia and Sustainable Development", Director of the unified State Information Mineral's Fund of Georgia, expert of the "Royal Gold" mining Company (USA), chief engineer in "Cordillera-2" mining Company, consultant of the "EMED" mining Company (Cyprus).